Obsessed with Coldplay but just can’t seem to catch them live? That’s fine because a Mumbai-based artist, Kalyani Nerurkar will doodle their songs for you to deck up your home and office walls. Started off under the Instagram handle, Doodle Riot, Kalyani, an illustrator and an ink artist has been doodling away all of our favourites songs from the band and creating prints integrating the lyrics in her doodles. The Coldplay Series is her ode to this band which was conceptualised whilst listening away to The Scientist on a rainy day. For her, every doodled illustration represents a story. For example, Clocks from the album A Rush Of Blood To The Head is her psychedelic representation of the piano tunes used in the song. Always In Your Head is another detailed work of hers depicting a woman’s face and her wavy hair that reflects the madness of being in love. However, one of our favourites is Parachutes. It’s a simple and beautiful colourful hot air balloon with a cuddly couple embodying the comfort love provides amidst the chaos. 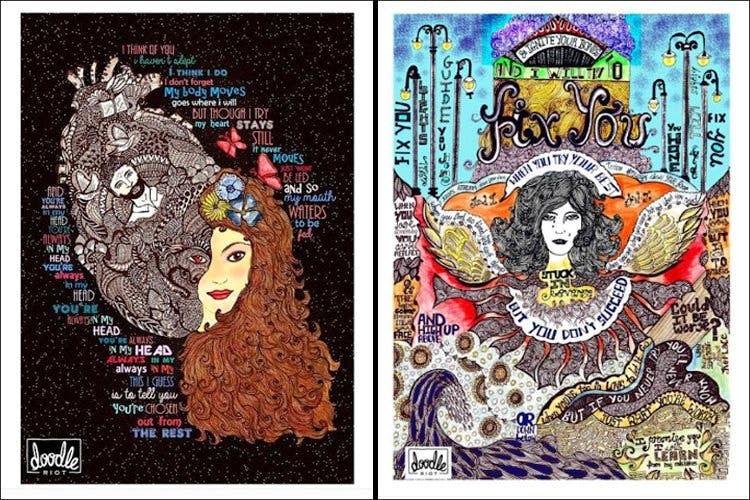 But moving away from the Coldplay series, her other pop music doodles is as remarkable. Remember the soulful tunes of Kabira from Yeh Jeewani Hai Deewani? Perfect for a Bollywood-crazed friend. Literally all of the doodles. Payday is here and we want to splurge it all on these gorgeous prints. We are obsessed with the Photographs print, a song by Ed Sheeranwhose video in itself is a movie. We are also loving the Mumbai typographic doodle with the city’s iconic landmarks. Last but not the least, an illustration of the quotes from the iconic and classic film, Pulp Fiction. In fact, apart from the doodles she’s already done she is open to taking customisation orders. Why browse the vast internet to find that perfect print of your favourite song/artist/film? Just get in touch with Kalyani via her instagram account, Doodle Riot, and funk up your walls. In fact, we are already halfway through adding these prints to the cart to deck up our drab office walls.